INDUSTRY.co.id - Jakarta - Auto financing company PT Andalan Finance Indonesia ("ANDALAN FINANCE") held the signing of a joint credit facility agreement with JA Mitsui Leasing Singapore Pte. Ltd. ("JMLS") for US $ 5,000,000. This cooperation was held at the Head Office of Andalan Finance and signed by Andalan Finance President Director Frans F. Rundengan, accompanied by President Commissioner Sebastianus H. Budi, Finance Director Lianawaty, and Chief Of Financial Institution Relationship Franklin Paul Nelwan while JMLS signed by Managing Director Naoto Matsumura, accompanied by Senior Manager, Yohei Sueki. 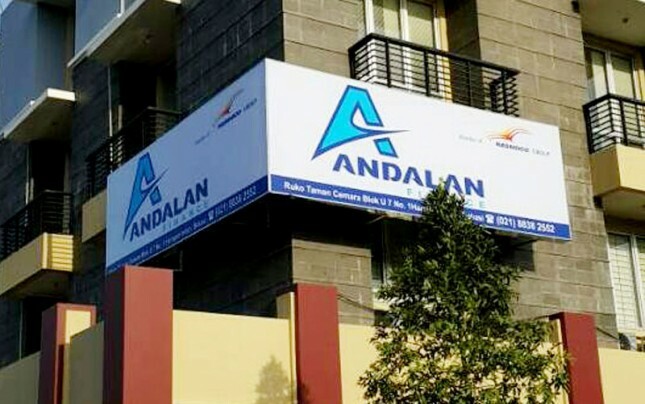 This cooperation is the first time accepted by Andalan Finance from JMLS. "We would like to thank JMLS for giving trust to Andalan Finance, hopefully this will be the beginning of a successful and long-term cooperation The fund collected from this cooperation will be used to strengthen financing capacity of Andalan Finance until the end of 2018 which we projected to increase to Rp 4.8 trillion or grew by 8% compared to financing in 2017, "said Frans F. Rundengan. "Up to May 2018, Andalan Finance has booked a new financing volume of Rp 2.28 trillion or has reached 47% of this year's target," added Frans F. Rundengan. In terms of funding, the company has worked with various national and foreign banking partners to support the company's working capital. The company's funding portfolio has so far been primarily derived from national bank loans, while continuing to increase cooperation with other foreign banks. "Although Indonesia's economic growth will experience some challenges, one of them is the political dynamics in 2018 and 2019, but we remain optimistic and have prepared several strategies, one of which is by strengthening used car financing with a certain age and maximizing sales volume in offices branch, "closed Frans F. Rudengan. The joint credit facility agreement with JMLS will strengthen the efforts of PT Industri and Trade Bintraco Dharma Tbk ("BINTRACO DHARMA") with the stock code "CARS" to maximize sustainable growth for the stakeholders. This sustained growth is reflected in the 35% net profit growth in the first quarter of 2018 and the consistency of the dividend distribution, which in June 2018 has been paid dividends of Rp 40 per share. From late 2017 to June 2018, Bintraco Dharma has completed a number of acquisitions and establishment of the company and continues to maximize profit growth from strategic partnerships.